This is what I drink whenever I feel the onset of cold, cough, sore throat or flu. 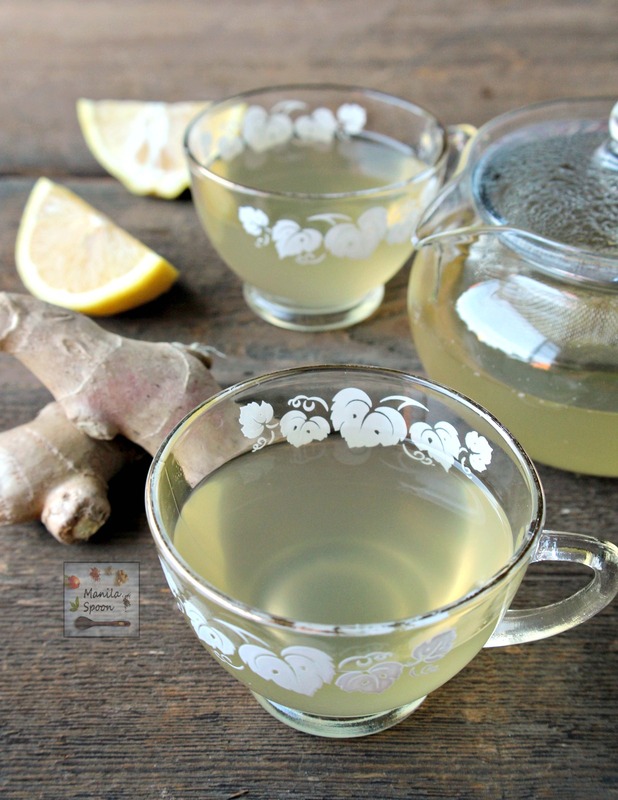 This fresh ginger tea with honey (salabat) helps boost your immune system and fight the nasty bugs. A delicious natural remedy that’s also perfect for tea time. However, we do have one traditional tea that we drink on a more regular basis, especially during the cooler months from December to February (that is if you think high 60s and low 70s is cold enough which is cold for those who live in a tropical country like ours – that warrants a light sweater at least!). The tea is called Salabat – made from brewed fresh ginger and often sweetened with honey or sugar and sometimes added with a few squeezes of fresh lemon juice for more potency. At the onset of cold, cough or flu and particularly sore throat – this is the first advice you will be given, “Drink Salabat a few times a day.” Of course we all know the health benefits of ginger, honey and lemon and I will not belabor that in this post but suffice it to say that this delicious tea drink (and yes, it is very tasty, indeed) helps you get rid of the bugs in your system. This is so much better than old store-bought and often tasteless variety of ginger tea and because it’s fresh then it is certainly more effective. In fact, I just read about a 104 year old man who lived in the mountainous region of the Philippines. When he was asked what his secret for longevity was he didn’t hesitate to say, “I drink Salabat everyday.” Of course there are other factors that contribute to his whole well-being for sure but I won’t be surprised that regular intake of this beneficial tea surely helped him a lot, too. At any rate, it is such delicious tea that whether you are feeling sick or not, it’s great for tea time with your favorite snack. You get the spicy zing from the ginger balanced with the sweetness of honey and a bit of tangy yum from freshly squeezed lemon juice. For sure this winter season I will be drinking salabat very very often so I can help myself maintain a good health during the cold months ahead. If you like what you see do subscribe to our posts via email. You can also like us in Facebook or join us on Pinterest so you can get the latest recipes and so much more. Thanks for visiting and happy browsing! Salabat is a traditional Filipino tea served during the cooler months to help fight and cure cold, cough, flu and sore throat. It is made from fresh ginger and sweetened with honey or sugar and may also be taken with a few drops of lemon juice. In a covered saucepan, bring the water and ginger slices to a boil. Lower the heat and simmer for 15-20 minutes. Strain and serve with honey and few drops of lemon juice, to taste. We need this at my house, my kids are constantly sick all winter long. I'm definitely going to make it for ALL of us to try and stay healthy. Hope it helps Sara! Thanks! Nothing is better than a fresh homemade tea. Ginger is so versatile and delicious! Perfect combination with the lemon juice in this recipe. That is so true Florian! Thanks!!! This is exactly what I need today. I have a horrible cold. I am going to brew this and enjoy. I just got over my cough and cold too and I drank this tea which helped clear my system. Hope you're feeling much better now. Thanks, Katie! It sure tastes as yummy as it looks. Hope you try it! I love tea with fresh ginger! It's so revitalizing. I cannot agree more Lauren! I start every day with a cup of hot water, lemon, honey and ginger and I have only had one cold in 3 years. It definitely works! Glad to know that Dannii!